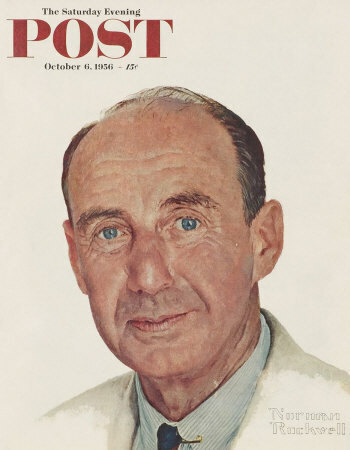 Portrait of Adlai E. Stevenson, a Norman Rockwell painting , appeared on the cover of The Saturday Evening Post published October 6, 1956. This is another timeless favorite of Rockwell collectors, a classic for all the ages. This painting was Rockwell's 291st overall out of 322 total paintings that were published on the cover of the Saturday Evening Post. Rockwell's career with the Post spanned 47 years, from his first cover illustration, Boy With Baby Carriage in 1916 to his last, Portrait of John F. Kennedy, in 1963. This was also the third cover for The Post in 1956. In 1956, there were five Norman Rockwell Saturday Evening Post covers published. on page 210 of Norman Rockwell, A Definitive Catalogue by Laurie Norton Moffatt. One study also appears in the Norman Rockwell Catalogue on page 210 and is part of a private collection. The presidential election campaign of 1952 featured two well respected candidates, former Illinois governor Adlai Ewing Stevenson II and Dwight David Eisenhower, a General during World War Two. Norman Rockwell was given the opportunity to meet and paint portraits of both candidates, Stevenson as well as Eisenhower. Stevenson was hard for Rockwell to catch up with. He was campaigning against a popular incumbent President, and he was very busy. However, he eventually need a break. Rockwell met with Stevenson while the candidate was catching a breather in his campaigning on his farm in Illinois. Rockwell described Stevenson as "amiable, kind, unpretentious and quietly charming." Portrait of Adlai E. Stevenson was only one of 322 Norman Rockwell Saturday Evening Post covers; Here is the list of Norman Rockwell Saturday Evening Post cover illustrations. Rockwell found Stevenson hard to draw. This was because Stevenson was so generally round-featured and it was harded to depict features that were not irregular. It is said that Rockwell told him that Abraham Lincoln was much easier to draw and Stevenson was much amused. The election of 1956 was won by Dwight D. Eisenhower, just as he had won in 1952. Stevenson campaigned again for the Democratic nomination in 1960, but lost the nomination to a young Senator named John F. Kennedy. Kennedy named Stevenson to be ambassador to the United Nations, where he served from 1961 under Presidents Kennedy and Johnson until his death in 1965. Many stories about Stevenson's wit are legendary. During one of Stevenson's three presidential campaigns, a supporter is said to have told him that he was certain to "get the vote of every thinking man" in the United States. Stevenson is said to reply to him, "Thank you, but I need a majority to win." Do You Have A Great Story, Opinion Or Contribution About Portrait of Adlai E. Stevenson?